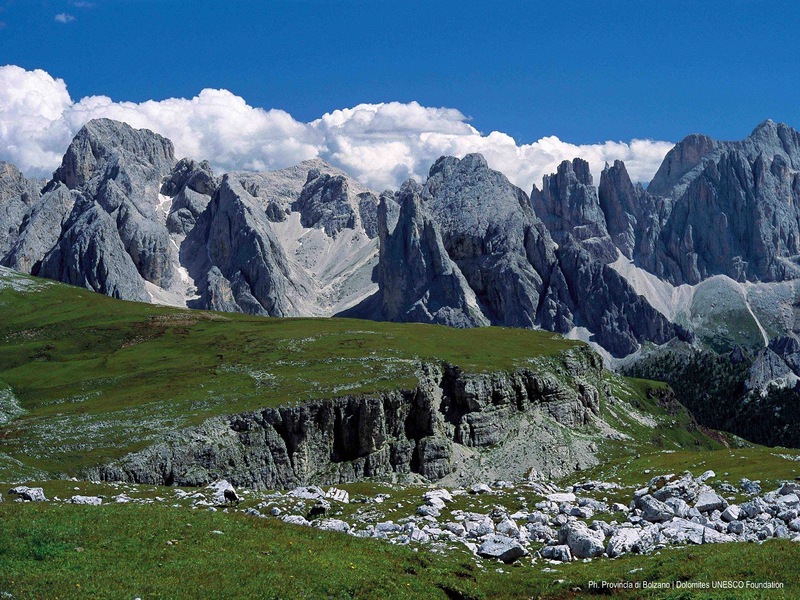 This system covers 9,302 hectares, shared between the provinces of Trento and Bolzano. 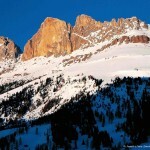 The Sciliar massif is between the high plateau of Fiè-Siusi, Val d’Isarco, Alpe di Siusi and Val Gardena. It is a compact massif of Dolomite rock and, depending on the aspect, it resembles a giant monolith with a flat top, from which Punta Santner (2,413m) and Punta Euringer project, or a rocky island with an immense escarpment merging with the pasturelands below, just as in ancient times the atoll melted into the bottom of the sea. 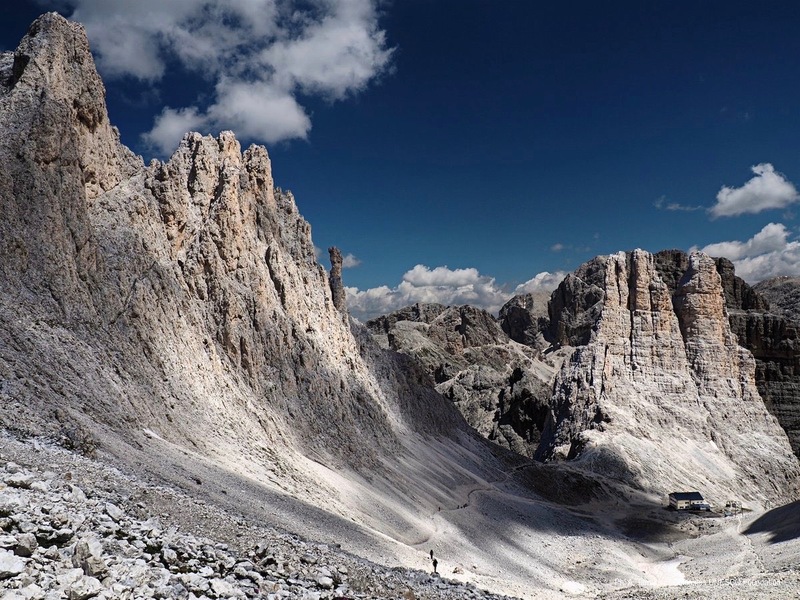 Mount Catinaccio, between the Carezza pass, Alpe di Tires and Val di Fassa is a rugged, craggy crest with a number of peaks reaching an altitude of 3,000 metres: Catinaccio d’Antermoia (3,002m), Catinaccio (2,981m), Cima Scalieret (2,887m), Torri del Vajolet (2,813m) and Roda di Vael (2,806m). From the 19th century, the geology of Catinaccio has been regarded as of prime importance for the study of the Dolomite stratigraphy of the Triassic period, since its readily accessible outcrops clearly show the relationship between carbonaceous sedimentation and volcanic activity. 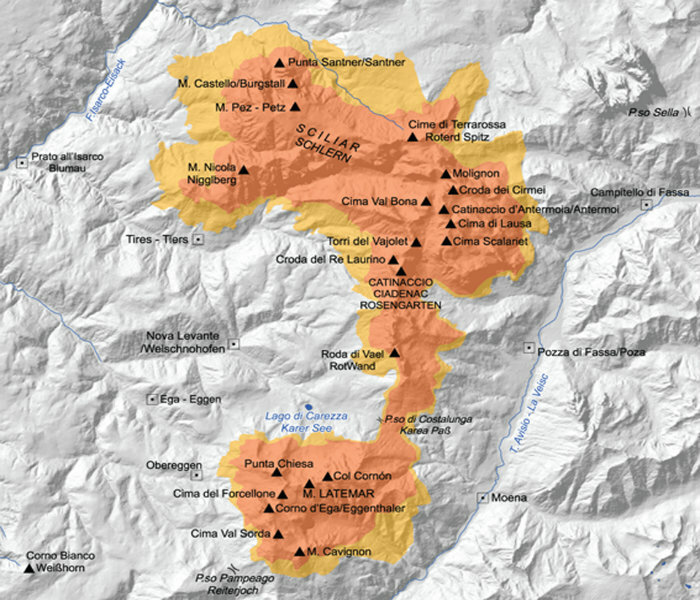 The Latemar chain is further south between the Fiemme and Fassa valleys in Trentino and Val d’Ega in Alto Adige. This fossil atoll features a large number of peaks: Croda di Lausa (2,876m), Campanili del Latemar (2,842 m), Schenon (2,791m), Cima di Val Bona (2,822 m), Molignon (2,820m) and Corno d’Ega 2,799m. 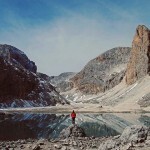 The scenic northern edge of the massif features the limpid waters of Lake Carezza reflecting the Campanili del Latemar peaks. As a response to the need to safeguard an area that was beginning to be over-exploited by the tourist industry, putting the landscape and environment in general at risk, the protected area Il Parco Naturale Sciliar-Catinaccio was set up in 1974, the first of these parks to be set up in the Province of Bolzano. The protected area covers a total area of over 7,000 hectares. Home to human habitation ever since ancient times, today the landscape varies from rocky crags and screes to woodlands of conifers and rolling pasturelands dotted with rustic dairies and charming little lakes. The indigenous floral treasures include the bellflower campanula morettiana and physoplexis comosa, the tufted horned rampion. The park is teeming with wildlife, home to roe deer, chamois, Alpine chough, golden eagles, black grouse and capercaillie. Finally there are the rocks, yet another of the park’s priceless legacies, telling a story dating back millions of years. 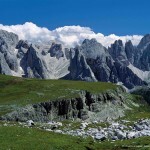 (www.provincia.bz.it/natura-territorio/temi/parchi-naturali.asp). The three chains in this system are particularly effective at telling the story of the Anisian-Ladinian-Carnian period, displaying the geometric and structural features of a number of different types of fossil islands. Here it is possible to both see and touch the geometry of the Ladinian and Carnian islands, due to aggradation, vertical growth, and progradation, horizontal growth. The geometric relationships have also been preserved between the internal lagoon and the cliffs on its edges and those between the cliffs and undersea escarpment. Here there is a unique opportunity to observe heteropic phenomenon in which sedimentary rock facies from different environments, in this case deep sea deposits and fossil islands, can be found in the same place. Since the outcrops are often on a scale of kilometres, it is possible to see the skeletal structure and growth dynamics of these islands. The deep sea deposits from different stages of evolution of the Triassic archipelago contain an abundance of fossils, bearing witness to the lifeforms in these seas. The area is also remarkable for the widespread volcanic rocks from the mid-Triassic volcanic event, in close association with sedimentary rocks. This association results in a high concentration of minerals, such as in Sciliar and Latemar. Another notable feature of this system is the way in which the fossil islands display a unique record, unlike anywhere else, of the effects of the volcanic activity and the associated Triassic tectonics, in the form of collapsing escarpments, undersea landslides and subaerial lava flows. Finally, it should be noted that this area has been subject to weak Alpine tectonic movements and therefore the geometric relationships between the sedimentary facies are particularly well preserved. All these features coupled with the accessibility of the sites and the many fossiliferous outcrops make the world’s scholars of Triassic stratigraphy flock to this place. The geomorphological set-up of this system is more heavily influenced by the variety of rocks and the architecture of the deposits bequeathed by the rocky mass during the Triassic period than by the orientation of the tectonic lines. The imposing summits of the Sciliar, Catinaccio-Antermoia and Latemar massifs consist of carbonate strata, faithfully reflecting the original geometry of three Ladinian fossil atolls which the morpho-selective processes caused to re-emerge with dramatic morphology. At their boundaries, most of the sheer, sloping rock faces are what were once ancient underwater escarpments and these are in stark contrast, in terms of both morphology and colour, to the gentler less steep slopes of softer volcanic rock in areas such as Alpe di Siusi, Val Duron, Costalunga, which have, since time immemorial, been used as meadows and pastures. Selective erosion has carved out the huge ledge cutting across soft layers of rock in the Livinallongo formation and sitting between vertical walls of compact Dolomite rock in the Contrin Formation and Sciliar Dolomite. The contours of the vertical walls, gullies and valleys inside the massifs, Alta Val del Vajolet, Valle di Antermoia, Piccola Val Bona and Grande Val Bona, Valle del Ciamin, Val Sorda, etc., follow the network of faults and fractures generated by lifting movements of the Alpine arc. 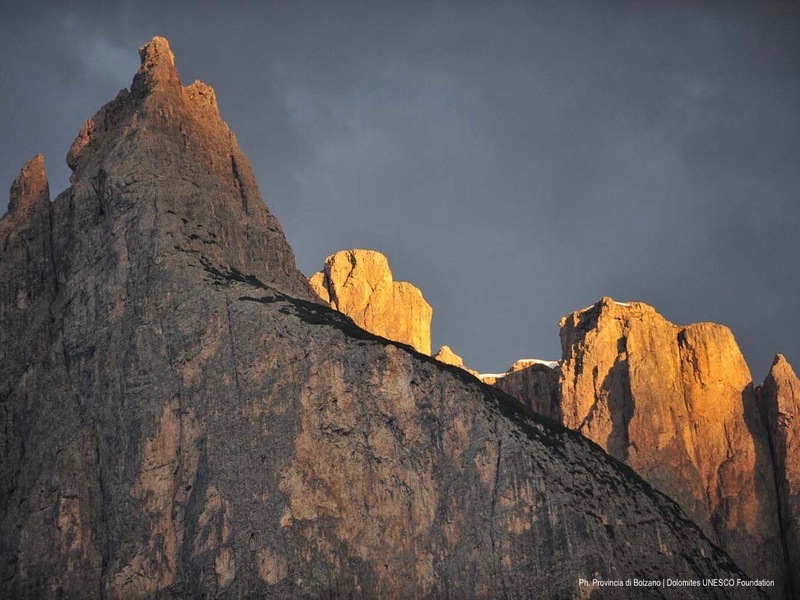 On the monumental Torri del Latemar and the Torri del Vajolet, the faults have cut compact horizontal layers and erosion has led to the formation of spectacular spires and pinnacles. 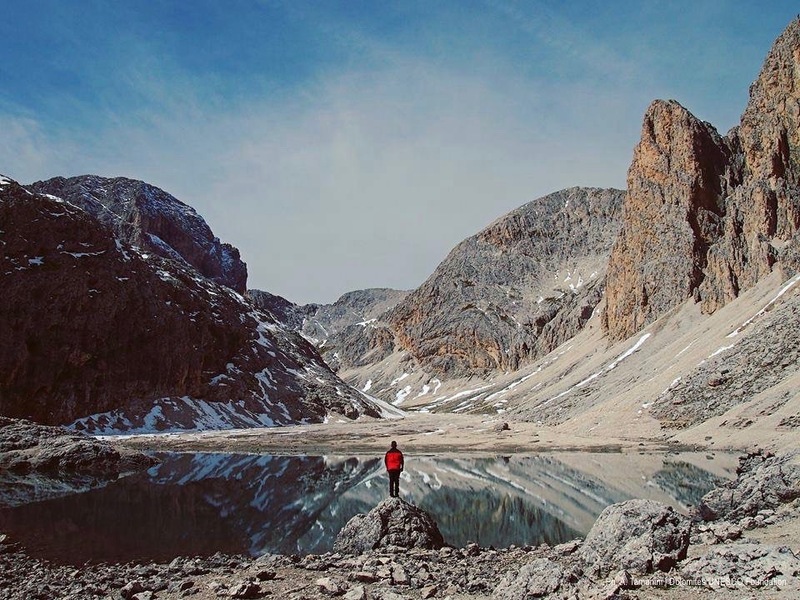 The calcareous layers of mount Latemar, the cirque of Val Sorda, contain some remarkable glacio-karst formations, known as sinkholes. There are a great many glacial morphological features, such the cirques in Vaiolon, Cigolate, Coronelle, Val Sorda and Valle di Carezza, and the hanging valleys in Val di Lausa, Val di Larsec, Vaiolon, Val di Antermoia, etc., with their associated small moraine deposits and sheepbacks. Extensive debris fields and cones are concentrated at the foot of the steeper, more fractured walls. These belts are the source of violent debris flows into Val del Vajolet, Val di Carezza, Antermoia Valley, etc. The freezing-thawing processes have reorganized the thick debris deposit creating typical rock glaciers, clearly visible on the western side of mount Catinaccio and the eastern side of Roda di Vael and/or the landslide debris on the Sciliar high plateau. The most frequent landslide types are collapses and slides along fractures. There are some huge fields of landslide debris with giant boulders around Pale Rabbiose and Roda di Vael. Monte Pez on the Sciliar plateau is an excellent example of slow gravitational deformation in which there is notable lateral spreading. This system boasts plenty of museums and exhibitions where you can explore the wonders of the natural environment and delve into its history as a human habitation ever since ancient times and whose cultures have left behind them a wealth of fascinating evidence. The visitor centre at the Sciliar-Catinaccio natural parkland is in Tires, in Bagni di Lavina Bianca. The centre occupies a historic building, once a water-powered sawmill, that has been completely restored to house artefacts telling the story of the traditional local crafts and customs. There are interactive installations, information panels and much more besides to help you learn all about the sawmill and the plants and animals populating this park, not to mention the geology of the Dolomites (www.provincia.bz.it/natura-territorio/temi/parchi-naturali.asp). For those interested in mineralogy, Il Museo Mineralogico Monzoni in Vigo di Fassa, housed in a restored traditional hay barn, has a collection of some 200 varieties of the minerals to be found in the Dolomites. 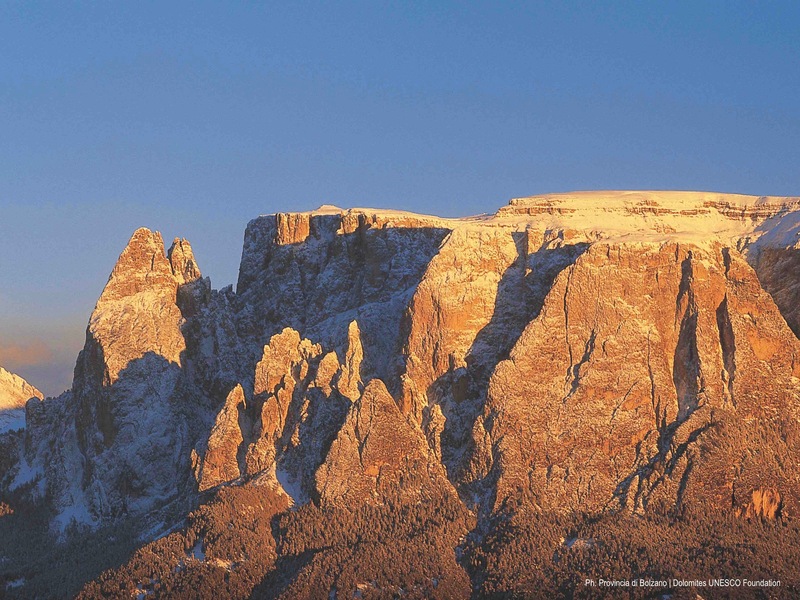 Il Museo Geologico delle Dolomiti in Predazzo, which is over a hundred years old, offers some fascinating insights into the geology and palaeontology of the Dolomites and of the Fiemme and Fassa valleys in particular. 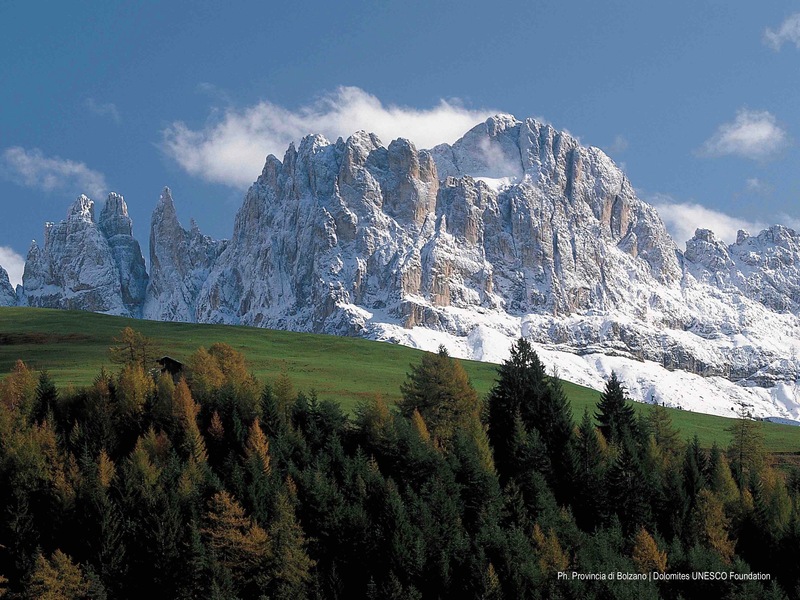 For those more interested in the human history and culture of the Dolomite people and their Ladin language and culture, Il Museo Ladino di Fassa in Vigo di Fassa (www.istladin.net) and the Tschötscherhof Museum in Castelrotto are both a must. The latter is a private museum, but with entry by voluntary donation, dedicated to the rustic peasant culture of Alto Adige, presenting an overview of its long history and a portrait of the daily lives of the people, their crafts, customs and traditions (www.tschoetscherhof.com). 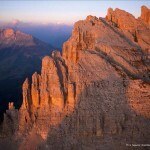 The art of the Dolomites is on show at the Pinacoteca (art gallery) at Il Palazzo della Magnifica Comunità in the centre of Cavalese (www.mcfiemme.eu) and the parochial museum, Il Museo Parrocchiale in Fiè allo Sciliar. The ancient chapel of San Michele houses works of sacred art from the late Gothic period, all originating in the neighbourhood of Fiè. On the ground floor you can visit the archaeological museum. 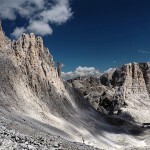 The Sciliar-Catinaccio-Latemar system is undoubtedly one of the best known to the world’s mountaineers. 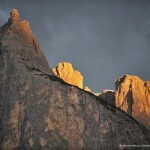 For years the climbers of Alto Adige have made a beeline for mount Sciliar. 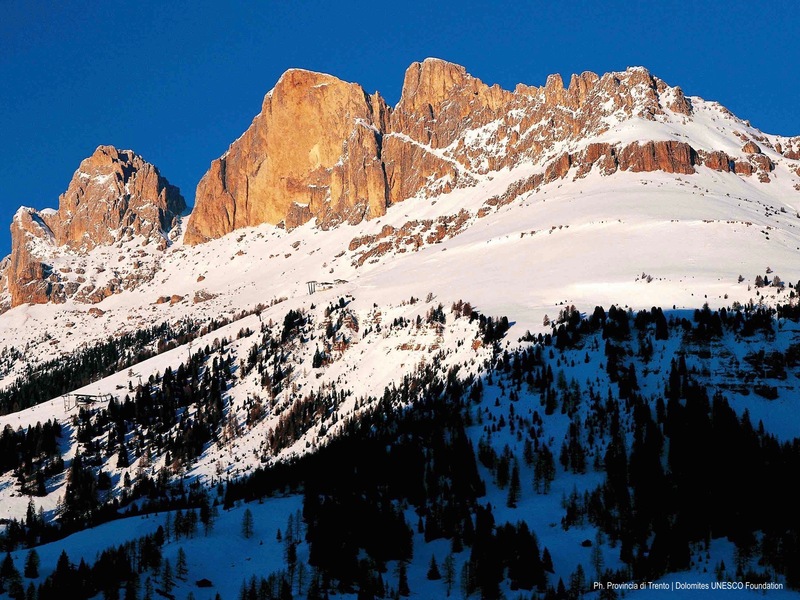 The ascents of the Torri del Vajolet of Tita Piaz, nicknamed “The Devil of the Dolomites” and the adventures of Georg Winkler, the first to achieve a Grade IV climb, doing so on these very peaks, are by now the stuff of legend. You do not need to be an experienced climber to enjoy this rocky paradise, these footpaths and trails are open to anyone with the will to try. Leaving from San Cipriano, in the Municipality of Tires, take footpath 7 leading to the Plafötsch dairy. The trail takes you through meadows and woodlands toward mount Catinaccio. 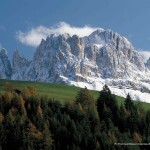 From the Haniger dairy there is a stunning view over the Torri del Vajolet peaks. After another uphill stretch beneath the rocky walls of Catinaccio, the Latemar chain comes into view. Where the trail forks, take the left-hand path towards the Baumann dairy in the Nigra pass, after which you can take footpath 1 back to the starting point, or hop on a bus. The hike to the Torre di Pisa refuge takes you through the dramatic, barren landscape of the Latemar chain. The refuge takes its name from the nearby rock pinnacle whose outline bears an uncanny resemblance to that icon of Tuscan architecture with its apparently precarious tilt. From Obereggen you take the cable-lift to Oberholz where you start off on footpath 18, climbing steeply up the mountainside, surrounded by stunning views of the rocky Latemar peaks. Near Gamsstallscharte there is a brief downhill stretch on footpath 516, after which you start climbing back up again to the Torre di Pisa refuge. 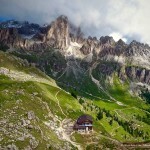 The refuge is on the summit of Cima Cavignon with a breath-taking view over the surrounding peaks and valleys. The downhill stretch back to Oberggen skirts the Pampeago pass and the Laner Alm refuge. 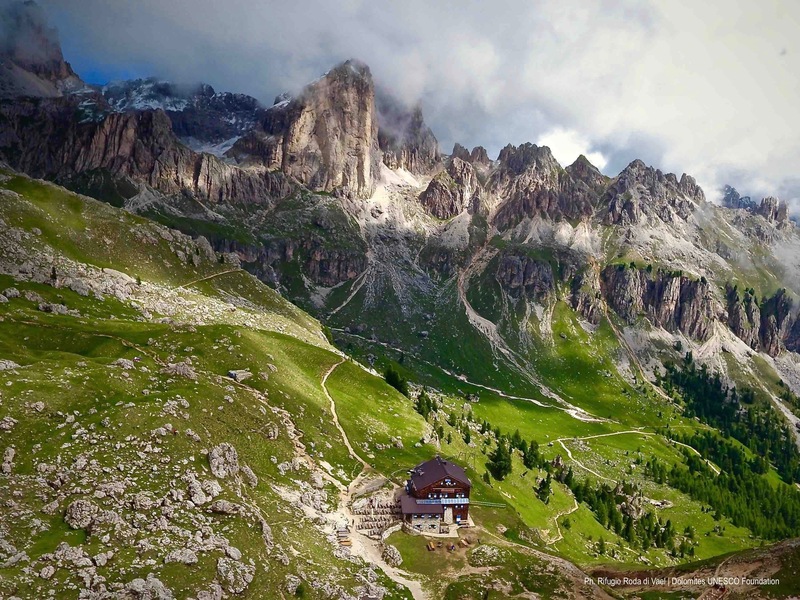 There can be no doubt that, of all the Dolomites systems, the Sciliar-Catinaccio-Latemar system has been the greatest source of folktales. Many of the myths, legends and sagas inspired by this magical landscape are still being told. 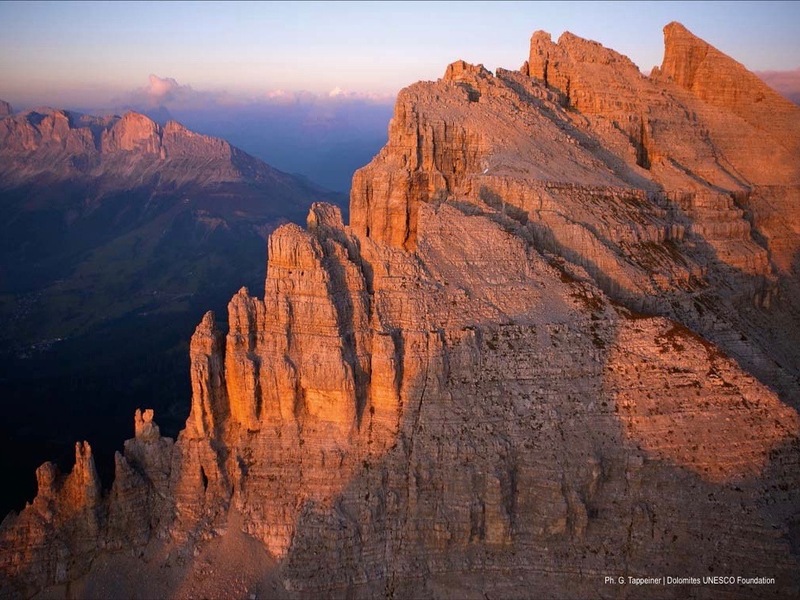 These very crags were the inspiration for the legend that sought to explain the phenomenon known as the Alpenglow when, at dawn and sunset, the Dolomite rock reacts to the changing light and takes on a distinctive red hue. 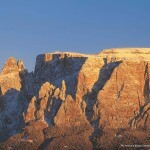 At sunset the Dolomite peaks are tinged with red. Why does this only happen here, and nowhere else on the planet? These days we know that this phenomenon, called Alpenglow, is due to the particular composition of the rock that reacts to changing light conditions. However, legend has it that this is all down to King Laurino’s rose garden. Laurino was the king of the dwarves, his kingdom set among the rocks of the Catinaccio chain. Among the knights at his service was a Valkyrie, Sittlieb, who was in love with the king for whom she had created a beautiful rose garden all around the castle. Unfortunately the king was in love with Similde, but he was unable to marry her because her father had promised her hand to whichever knight was the victor of a tournament held for that purpose. As a dwarf, Laurino was barred from this tournament and so he kidnapped Similde, donning the magic hat that made him invisible, and hid her in the rose garden. Consumed with jealousy, Sittlieb the Valkyrie fled the kingdom. She called on the services of a sorceress, asking her to make her look like a man, to which the sorceress agreed, with just one condition: she would die if she returned to King Laurino’s rose garden. Meanwhile, Hartwig, a knight who was in love with Similde, headed for the rose garden to save the damsel in distress. When he arrived, the guards told him that the garden was surrounded by a silk thread that, if broken, would summon the dwarf army to the scene. Hartwig also learned why the young girl was being held prisoner and that Laurino would set her free if he were allowed to take part in the tournament on an equal footing with the other suitors. The knight explained the situation to her father, but the count would not accept the compromise. Hartwig then turned to Theodoric, King of the Goths, asking him to send his army to intervene. Theodoric granted his request. Serving in this army was Sittlieb, in her male guise. She never took off her suit of armour and spoke in a deep, man’s voice so no one recognised her as the Valkyrie previously in the service of King Laurino. Sittlieb was given the task of leading the army of the Goths to Laurino’s kingdom, a job she accepted, despite the condition laid down by the sorceress. On their arrival at the rose garden, Theodoric cut the silk thread summoning the dwarf army and the two sides engaged in battle. Thanks to the magic hat that made him invisible, the belt that gave him the strength of a dozen men and an impenetrable suit of armour, Laurino seemed to be getting the better of the Goths, but Theodoric managed to grab and subdue him. Once freed, Similde interceded on behalf of King Laurino, who had always treated her with loving kindness. Theodoric offered to make peace with his defeated enemy and a great banquet was held in celebration. During the night, one of Theodoric’s warriors entered the rose garden and the two armies once again began to fight one another. Defeated a second time, Laurino was held prisoner. The offending warrior was Sittlieb, who had never removed her armour. She challenged Theodoric to a dual to win liberty for the king of the dwarves. The king of the Goths was once again the victor and, when he removed his defeated opponent’s helmet, he discovered that she was a woman, mortally wounded, as the sorceress had predicted. The war was at an end and with it came the end of the kingdom of the dwarves. Hartwig and Similde eloped together and lived happily ever after. After years as a prisoner, Laurino was able to free himself and return to his mountain home. He discovered that all his people were gone and, overcome with grief, he cast a magic spell to turn the lovely rose garden to stone and make it invisible by day and by night. But he forgot to mention sunset in his spell and so, from that day on, the beautiful rose garden of the king of the dwarves became visible just for those few twilight minutes, when the rocks of the Catinaccio, now known as the Rose Garden (Rosengarten, or Giardino delle Rose) became tinged with red. 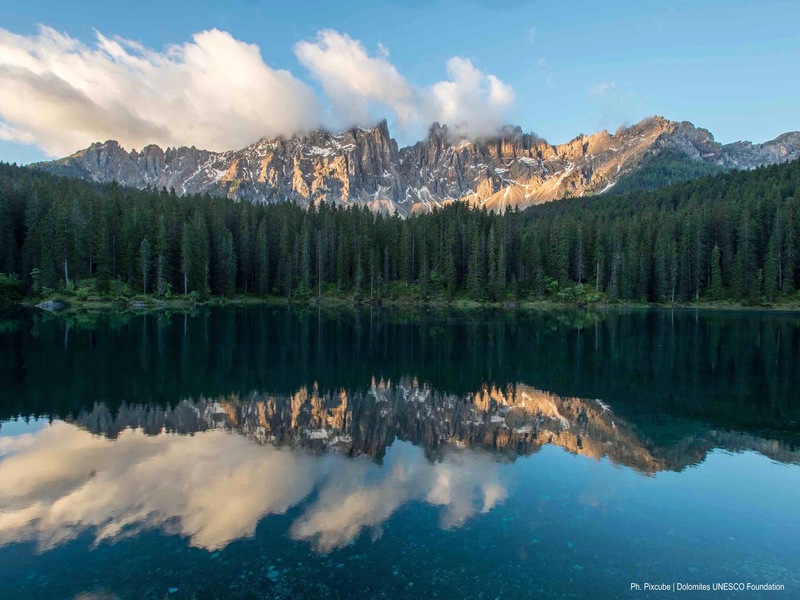 Lake Carezza is famous for the myriad shades of colour its waters take on as they reflect the rocky pinnacles of the Latemar peaks that tower over the woodlands. 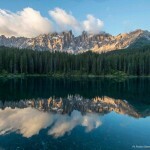 The waters of the other local lakes look just blue or green, but those of Lake Carezza have all the colours of the rainbow, and this is why. In Lake Carezza there once lived a beautiful siren who was accustomed to emerge from the water, sit on a stone in the middle of the lake and sing. Wayfarers travelling through the forest were enchanted by her sweet voice. One day the wizard of Masarè passed by. He immediately fell in love with the gorgeous creature, but the siren did not return his affections. Having tried and failed to win over the siren, using all his magic arts, the wizard turned to the witch Langwerda, who lived on Mount Sciliar. The witch advised him to dress up as a merchant and to take a walk along the banks of the lake to tempt the siren out of the water with his fabulous array of jewellery and precious stones. The wizard’s first attempt was a failure. The siren saw the jewels but did not come out of the lake. The man then returned to the witch who told him to use his precious stones to create the most beautiful rainbow ever seen. This sight would so enchant the siren that she would come out of the lake to get a better view of it. The wizard created a stupendous rainbow and made it stretch from the Latemar to the Catinaccio peaks. He too was captivated by the beauty of the rainbow, so much so, that he forgot to put on his disguise. As soon as she set eyes on the wizard, the siren realised the trick and she dived back into the lake, never to emerge again. Grief-stricken over the loss of his beloved, the wizard smashed the rainbow to smithereens and threw the pieces into the lake. From that day on Lake Carezza is resplendent with all the fabulous colours of the wizard of Masarè’s rainbow.